Farrier Lee Canham works in the dark Finnish winter with a headlamp that illuminates the hoof for him. They call it the Midnight Sun. In winter, above a certain northern latitude, there's simply not much daylight. For farriers who must keep working on their clients' hooves, that means shoeing in the dark for at least part of the year. 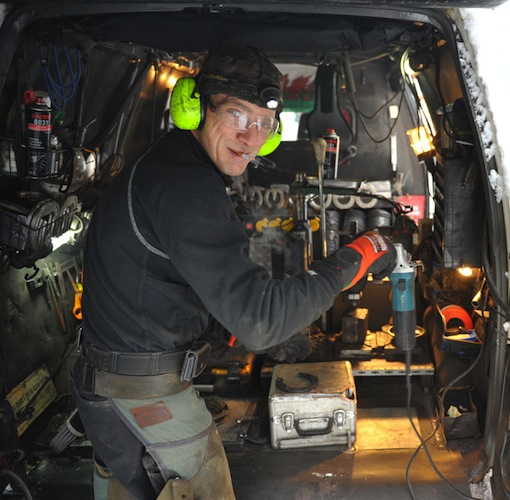 "No matter how well lit up a place is, a farrier will almost always find his or herself working in their own shadow," wrote Lee, who was born in Wales and has also lived in Spain, Iceland, and Sweden. "Hence the headlamp: problem solved! That´s my theory; also it's dark half of the time in Finland and when it's minus 20 or 30 degrees (Celsius), a good headlamp can help with the frostbitten fingers." Tuomas Kauko likes the idea of conjuring the image of a dentist in his clients' minds: "I use it to look professional," he said. "I'm quite convinced that usually people think that I'm kind of like a dentist but just a bit sensitive to strong odors so I can't work around people`s mouths..."
I think his tongue was in his frozen cheek for that one, since farriers are bound to catch--or even create--some interesting odors in their daily work. The Hoof Blog originally found Tuomas and Lee through this portrait of Tuomas at work, taken by Lee. I used it as an example of how to take a good picture of a farrier: the photographer should get down low and shoot up--too many photos of farriers don't show their faces well, if at all, because of angle compromises, lighting, and cap brims. But I didn't realize until much later that the photo was actually taken by a farrier, which helps explain why it is so good. The headlamp intrigued me and I decided to track these two down--even though they are a world away in Finland. And I'm glad I did. "Not that many farriers use headlamps," Tuomas continued. "I think it`s a neglected but (sometimes) very useful tool. I think Lee always uses his lamp but I only use in stables that have poor lighting. Winter time we don`t get much light from the windows so I end up using it much more during the winter. "By the way, I once spoke with a German guy who was doing his apprenticeship with a very, very respected farrier and they always used tiny headlamps," he added. "The headlamp I use is the kind they sell for sport." Lee and Tuomas don't work together, but their paths cross--so these two talented photographers sometimes get to take photos of each other, like the ones you see here. "Tuomas and I occasionally get to work at the same stables and sharing the same hobby (with the cameras) makes work more fun than it already is," Lee wrote. If it sounds like Lee and Tuomas are far, far away in their corner of northern Europe, remember that everyone else seems that way to them. Their beautiful country is the center of their universe. Lee waxed philosophical on the loneliness, sometimes, of the self-employed. He wrote, "Have you ever heard that being a farrier is always challenging? Of course you have. What I think makes it more challenging is the fact that every farrier is so busy and one soon becomes isolated by working for and with one's self. Therefore, the ability to learn from others can be cut off. "This is where your (Hoofcare + Lameness/The Hoof Blog) site becomes a farrier's asset, along with his tools," he added. As I write this, Tuomas is leaving for India and Nepal on holiday. He has traveled the world seeking adventure and, as he goes, documenting the horses and farriers he meets. He's even been to Australia and been on a wild horse research trip to the Outback with Dr Pollitt's Australian Brumby Research Unit. His goal--enthusiastically encouraged by his interviewer, who is now one of his biggest fans--is to publish a book of his photos about shoeing around the world. The sunlight in India will surely blind him when he gets off the plane but I'm sure he has a plan for that. Thanks to Tuomas and Lee for their help with this article and for their beautiful, inspiring photography, which they kindly agree to share with Hoof Blog readers today.